In his final opera, what we know of the mature Mozart's philosophical and spiritual beliefs—less than a year from his death at the age of 35—is often problematic for critics, who either do not understand their nature, or purposefully ignore them, since recognizing them would require more than they are willing to do with their own lives. Yet, for an ever-evolving artist such as Mozart, his late opera and theatre scores were overtly in service to his quest for enlightenment, a century before the sacred books of eastern spiritual practices were translated into European languages. Instead, Mozart found a path offered through Freemasonry, which incorporated Egyptian symbolism into its rites of initiation. In Central City Opera's current production, director Alessandro Talevi embraces Mozart's point-of-view, in seeing the 180-degree change in the hero's objectives as a natural part of his conscious spiritual evolution. Essentially, the lesson for Tamino, a prince in search of a quest, is that what may seem true, good, and loving may, in fact, be an illusion; and that what may seem evil and unjust may be the path to true knowledge and understanding. This would be the equivalent today of fundamentalist practitioners of any religion abandoning their rigid organizations and dogmatic explanations, and finding spiritual fulfillment in a more inclusive universe. This breakthrough in Tamino's consciousness is what continues to make The Magic Flute relevant—given the matrix within which most of the world has been wrapped—and what continues to make it one of the most performed operas around the world. In addition to Talevi's embrace of Tamino's transformation, he sets out to enhance the perception of Sarastro, whose centeredness and rationality are sometimes perceived as "boring and two-dimensional," while the Queen of the Night, whose devious intentions are hidden, seems more compelling. To accomplish this, Talevi turns the three child-spirits—who, in the original libretto guide Tamino to Sarastro's temple—into the through line of the story, in order to leverage their innocence in what becomes a dream-state tale drawn from an invented domestic backstory. But rather than enhancing Sarastro and his teachings, the Felliniesque (á la Satyricon), circus-like menagerie surrounding him degrades the elevated teachings that he delivers (and seems too decadent for children's dreams). All of this would be unnecessary if Sarastro's grandeur were enhanced by costumes, sets, and lighting effects, which, granted, require some expenditure. For example, in the 1793 production in Brno, Moravia (Czech Republic), Sarastro arrived in a chariot pulled by lions. The Egyptian-flavored costumes worn by The Speaker and some of his seconds are exotic in this way, but seemed strangely out-of-place among strongmen and other carnies. Besides, Sarastro's words, though simple, ring true, depending on the context and manner of their delivery. This adaptive distraction aside, the vocal and theatrical performances are all excellent. 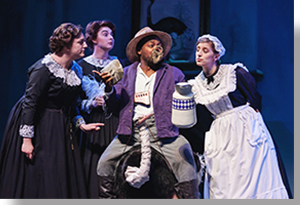 At the center of the opera's strong comedic elements is Papageno (Will Liverman), a carefree bird catcher, wanderer, fool, and sensualist, who serves as the counterpoint to the lofty ambitions of Tamino (Joseph Dennis), who focuses on enlightenment and winning the hand of Pamina (Katherine Manley), the lovely daughter of the Queen of the Night (Jeni Houser). 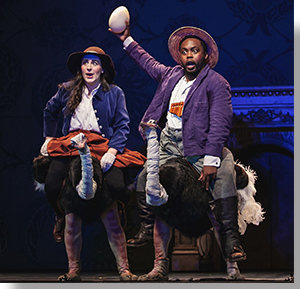 Rather than the traditional feathered man, Talevi's Papageno rides a liberally plumed ostrich, half-puppet (the wandering long neck and head), half costume (the legs, body, and tail). This brings guffaws from the audience and sets up a steady stream of good-natured jokes and silliness from Papageno. Liverman's light touch and excellent timing, as well as his bright baritone, are a delight. And, yes, his duet with Papagena (Véronique Filloux), "Pa-pa-ge-na, Pa-pa-ge-no,"—enhanced by the shtick with the eggs—is a show stopper! 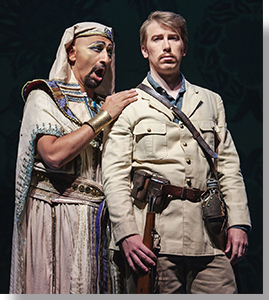 The higher octave of Papageno's earthy arc is Tamino's spiritual quest (although both are blessed with the perfect mate in the course of their journey). The opera opens with Tamino importuning the gods to save him from a dragon. 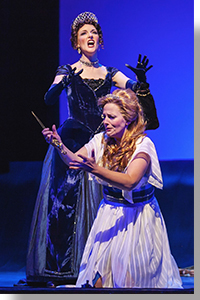 He then learns from the three Ladies who save him that Pamina is being held captive by Sarastro. One look at her picture and he's in love, vowing to save her, but he quickly reaches a crossroads at the Sarastro's temple, where he must evaluate the veracity of the two different stories that he has been told, culminating in his choice of Sarastro's vision of illumination, rather than the Queen's illusory vision. 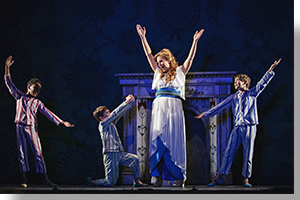 During the course of Tamino's adventure, Dennis gets to show off his warm tenor and passion, initially when he falls in love with Pamina via the painting shown to him by the three ladies, when he extols her beauty, then later, when the three Ladies present him with the magic flute, and finally, in the duet with Pamina (Manley), where they exchange vows before together undergoing the severe final tests of initiation. Manley's soprano shines is this duet, as Pamina is released from her fears of losing Tamino, which we heard in a prior aria, where Manley conveys Pamina's dispair that is driving her toward suicide. Earlier, in Act I, Manley charms us in a sweet and light duet with Papageno (Liverman), where he has told her of Tamino's love for her and then sings of his own dream for a mate, before Pamina does the same. It's easy to see why director Talevi sought to beef up Sarastro's presence, because the role of the Queen of the Night (Jeni Houser) packs a wallop. Houser's coloratura is divine, even if the character which she plays is a bit of a she-devil. Her opening aria, in which she comes alive in a picture frame, is thoroughly captivating, as is her magnificent costume and refined setting. In the first scene, after the three Ladies punish Papageno for lying to Tamino about slaying the dragon—by putting a lock on his mouth—there is a hilarious sequence where each of them tries to get the other two to leave, so she can be alone with the handsome prince. Throughout the opera, the three ladies intervene as a magical chorus, with sublime harmonies and timely conjuring. At the time Mozart wrote the opera (actually it is a singspiel), he also had been writing for a theatre company with an odd assortment of voices and vocal experience, including virtuosi and ordinary comedic actors. 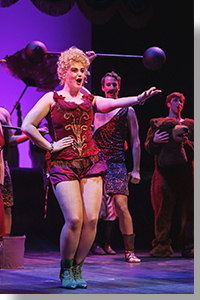 This can be seen in his approach to different roles; for example, the vocal lines for Papageno are often stated first in the strings, so the singer can find his pitch, and are frequently doubled by instruments. In Mozart's hands, all of this is seamless, never drawing attention to itself; instead, it elevates the performances of the vocalists. For Sarastro, Mozart includes a conspicuous F2 (two Fs below middle C) in a few locations, which Kevin Langan deftly handles with his strong bass. Thrilling! At the extreme other end, the three spirits, selected young boys from the Colorado Children's Corale, are superb with treble, alto, and mezzo-soprano harmonies. Mozart's masterful score is elegantly rendered by the 49-piece Festival Orchestra under the baton of André de Ridder. Kudos to Richard Cross' German diction coaching for the singspiel's crisp spoken words. Both Mozart and his librettist, Emanuel Schikaneder (the original Sarastro), were Freemasons, as was Ignaz Alberti, engraver and printer of the first libretto. Many of the symbols as well as the initiation rights are simplified versions drawn from this tradition; but the libretto also shows influences from the Enlightenment, which began approximately 75 years before the opera was composed. In short, the Queen of the Night probably represents the anti-Masonic Roman Catholic Empress Maria Theresa; or, behind her, the Roman Catholic Church itself, which was also strongly anti-Masonic,1 so Mozart was sticking his neck out here. Coincidentally, he died shortly after conducting the premiere and witnessing some early successes, which grew substantially after his death. Mozart's depiction as a devout Catholic must be questioned based on what is presented here. Despite the evolved pretentions of the Masons and the Englightment, the libretto contains a variety of temporal prejudices at odds with present standards of evolutionary development, including misogyny and racism; although, this could be said of much of the past as well as present-day philosophies, religions, and "spiritual" practices. 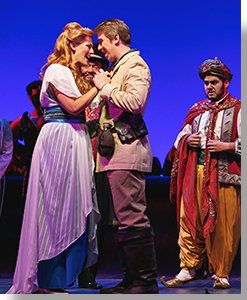 Central City Opera's presentation of The Magic Flute, runs through August 5th, in repertory with Il Trovatore and Acis and Galatea. For tickets: https://centralcityopera.org/2018-events.